In these times, saying that a band innovates in Gothic Rock music seems a true display of audacity. 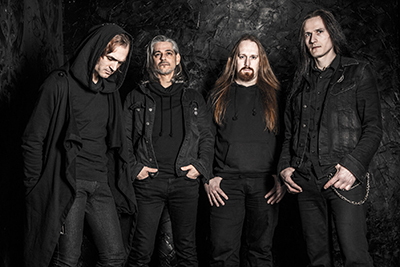 However, the German band Aeon Sable has been revamping this genre since its inception six years ago. With each new release – which they actually are, like the visions coded within them – and ritual on stage – as we could fortunately witness during the VII Semana Gótica de Madrid Festival – Din-Tah Aeon and Nino Sable craft songs that slowly induce a pleasant half-conscious journey through the intersection between shadow and light, epic and fragility, rekindling in us deeply felt memories that give even more authenticity to the experience. On the basis of emotionally loaded, either mellow or throaty vocals, and a deliberate co-driving which alternates imposing riffs in unison with signed ringing guitar tunes, Aeon Sable faithfully expresses a paradoxical mixture of feelings. Warmth and coldness, calm and anxiety, pleasure and pain… all of them blown into arcane and psychedelic air. Precisely, it’s this proficient handling of rhythm and atmosphere, along with the smooth integration of slow-burning, melodic metal extras, what makes Aeon Sable‘s sound unique and recognizable. So, if there is a band who earns the alias of Psychonauts, it’s unquestionably Aeon Sable, and you all know the great vibes which are encompassed in such a word.